You asked for it - now you have it. The award-winning Automoblox® Emergency Response Line is now available as a Mini 3-pack! The same premium finishes and sophisticated graphics as our Originals now in our "on-the-go" scale. Interchangeable with all other Automoblox® Mini’s. There are few things as appealing as a pick-up truck. They are what you take over back woods trails or what you throw your stuff into before zooming off to your next adventure. This truck will have your children imagining daring adventures over rock strewn trails and long trips to places only a beloved pick-up can take them. — In a February 2015 survey, David Stelzer, owner of Shananigans in Baltimore, Md., told TDmonthly that Automoblox is his store's best-selling wooden toy. They sell around 50 every month. Kids can take a drive on the wild side with this full-size Blue T900 Truck. This big blue truck features a universal connector system, enabling the rapid interchange of parts so that drivers can expand their creative play to take on new adventures. This Automoblox pack is designed to make playtime fun and creative. The Automoblox hot rod minis feature a universal connector system that enables the rapid interchange of parts, and are conveniently sized for on-the-go car design. The set includes a red/black HR1, a black/gray HRw and a red/chrome HR3. — Jeanette Lauture, owner of Aunt Jean’s Toys & Treats in Montclair, N.J., sells approximately 4 to 10 per month. Complete with interchangeable parts like the rest of the Automoblox collection, the T900 features a chrome grill and bumpers, all-terrain tires on chrome wheels, and an overall sleek, sporty design. 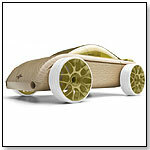 — Four of 38 specialty retailers named Automoblox as a top-selling wooden toy in February 2010. "Automoblox do really well," said Stacy Solie of Leapin' Lizards Toy Co. in Bend, Ore., citing sales of about 2 dozen per month. This performance design of the S9 sedan features a deep blue shade with two color emblems and fully branded center capsg. It rides lower to the ground on bigger wheels with low-profile tires, and has been reduced to three blocks. The front and rear blocks accept a front splitter and a rear diffuser. With deck and chin spoilers, rear diffusers, side skirts, large blue wheels, silver top and other high performance styling cues, this Silver S9-R of the Automoblox R-Line speaks the language of serious driving fun. Fully interchangeable with other models, R-Line owners can mix-and-match parts to build unique performance models or just add a little horse power to the current Automoblox styles. With deck and chin spoilers, rear diffusers, side skirts, large red wheels, silver top and side accents plus other high performance styling cues, this White C9-R of the Automoblox R-Line speaks the language of serious driving fun. Fully interchangeable with other models, R-Line owners can mix-and-match parts to build unique performance models or just add a little horse power to the current Automoblox styles. Design is in the details and the C9-S will add a strong dose of sophistication to your existing Automoblox collection. The stylish A-9S features a speedster body and driving lights set lower than on the standard A9. The beech wood construction is complemented by shiny black wheels and white molded components that are interchangeable with other Automoblox designs. This sport utility vehicle is built for high-quality performance on rugged terrain. The wooden replica features durable body accessories permanently fixed to the simple wooden body blocks. Launch date: February 2008. This replica of the purpose-built, performance-oriented sport sedan features durable body accessories permanently fixed to the simple wooden body blocks. Launch date: February 2008. The purpose-built, performance-oriented car features durable body accessories permanently fixed to the simple wooden body blocks. Launch date: February 2008. — “Automoblox always does very well. Usually, when we get those in, we sell through,” Leslie Chiaverini, owner of Adventure Toys and Teacher Supplies in Los Altos, Calif., told TDmonthly. — “Automoblox have become very hot. They're a little pricey … but people really seem to like them,” Yamil Castillo, owner of The Red Balloon Toy Store in Salt Lake City, Utah, told TDmonthly in April 2008. — In spring 2008, three of 50 retailers mentioned Automoblox to TDmonthly, when asked about best-selling construction toys and those they are interested in selling in their stores. Automoblox Minis are a reinvention of the classic wooden toy car — a fusion of heirloom craftsmanship and ultra-modern styling, transformed into a mix-and-match design system that allows kids to create their own special car styles. This truck features blue wheels and a transparent blue top. “The fact is, there are no similar products. That’s what sets the Minis apart from everything else,” Manager of Public Relations Tina Noelle Mezzina of Automoblox told TDmonthly. Launch date: October 2007. 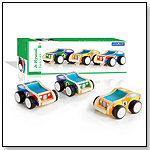 — A smaller version of the original Automoblox, the Minis earned a TDmonthly Top Toy 2007 award by coupling classic wooden design with sleek, colorful modern appeal. Automoblox vehicles drive away with a prize because they have a construction component, feature quality materials, come in various styles, are virtually indestructible and are ideal for both play and display. Automoblox MINIs are a reinvention of the classic wooden toy car — a fusion of heirloom craftsmanship and ultra-modern styling, transformed into a mix-and-match design system that allows kids to create their own distinctive car styles. ”We’ve combined old-school durability, ultra-modern style and an innovative play pattern to create a new generation of classic car toys. 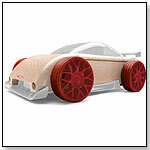 The Automoblox MINI line makes it fun for kids to explore their own unique design instincts by combining warm wooden blocks, colorful rubber tires and bright translucent plastics to create super-cool car styles,” PR Manager Tina Noelle Mezzina of Automoblox told TDmonthly. A three-pack plus accessories are also available (MSRP: $24.99). Launch date: August 2007. 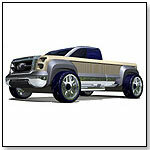 Turn any of your Automoblox vehicles into a six-wheeler by adding one of our Extension Blox to your Automoblox garage. Get two Extension Blox and create an eight-wheeler. 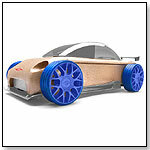 It includes two C9 wheels and tires, and is compatible with most models. ― Automoblox is “very nice to deal with [and has] great sales reps,” said Martin Goetzinger, founder of www.schooldelay.com, in spring 2007. Turn any of your Automoblox vehicles into a six-wheeler by adding one of our Extension Blox to your Automoblox garage. Get two Extension Blox and create an eight-wheeler. Includes two C9 wheels and tires. Compatible with most models. The rich purple roof and soft rubber tires appropriately dress the Automoblox King of the Road. With an increased ride height and extra-large rims, this ride rolls with the big boys. Increased storage capacity in the rear block allows this ultimate lifestyle vehicle to be equally big on adventure and style. The Automoblox M9 comfortably seats eight of our cool, blue people. The extra-long main passenger compartment and additional seating for four in the rear block give this vehicle the longest wheelbase in the line-up. Now your child can build a minivan like mom’s that even dad will want to drive. Inspired by the compact cars popular in Europe and Japan, the A9 is certainly big on style for its small frame. Featuring small three-spoke wheels, low-profile tires, and a generous roofline with plenty of headroom, it is sure to get great mileage from this little gem. — As of 05/13/2011 this product had 4.8 out of 5 stars from 6 reviews on Amazon.com. Cons: One reviewer mentioned that the price was rather high, but then said the quality of the product was worth it. — “We have some Automoblox. It's a fairly new line and we're doing great with them. I've reordered three times this month,” said Melinda Pontanares, manager of Apple Box Toys in San Diego, Calif., reporting sales of about 150 per month during a July 2009 survey of best-selling collectibles.